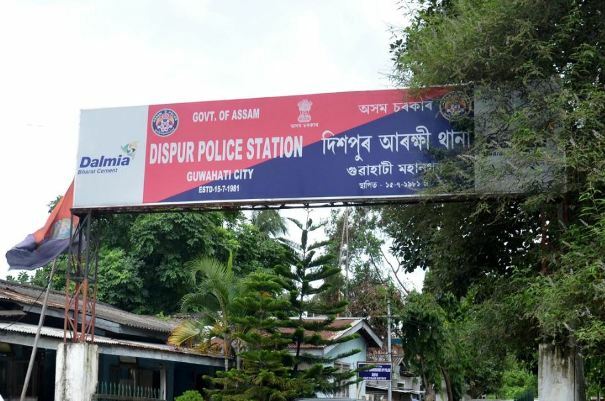 File image of Dispur Police Station. Sub-inspector of police Nipu Kalita, who had been absconding for the last one week after looting a huge amount of gold from gold smugglers, finally surrendered at Basistha Police Station in Guwahati on Wednesday. Nipu Kalita, posted at Dispur Police Station, was arrested by police immediately after his surrender and is being interrogated. It may be mentioned that the police officer had allegedly looted gold biscuits worth Rs 4 crore after seizure of the same from gold smugglers during an operation on the Guwahati-Shillong Road at Nongpoh. The police officer had to be a was accompanied by havildar Faijur Rahman and home guard Afjal Ali. On the other hand, although Nipu Kalita has surrendered on Wednesday, the police have not been to recover the looted gold biscuits. Nipu Kalita’s accomplices, havildar Faijur Rahman and home guard Afjal Ali are still on the run. The incident where the police turned out to be robbers during operation created much sensation in the city. Since lodging of the FIR on February 5, Nipu Kalita had been absconding and surrendered before Basistha Police Station on Wednesday.